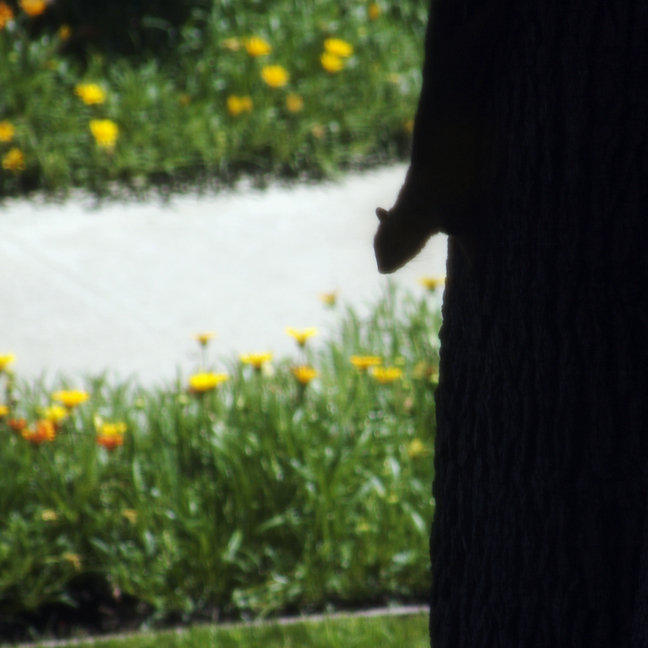 Once upon a time, a squirrel was trying to establish a home in a tree in the middle of the urban sprawl of Los Angeles. It was a simple tree in the simple garden courtyard of a simple apartment complex; but the task was not simple. As the squirrel tried to move in his belongings, he discovered a whirring of activity around his head. And this whirring would not stop. He couldn’t tell where it was coming from. Here! There! It seemed to come from everywhere! He looked down to the earth and there lay a gray tabbycat, who was watching with earnest amusement. The squirrel quickly realized that this cat was watching the whirring of activity that buzzed around his head! Down below the cat trotted away, content to know that the hummingbird would be around for a while, but still wanting to get out of the irate squirrel’s path. The squirrel was left in utter frustration and confusion. Frozen upsidedown halfway up the truck of what it thought was it’s new tree, he waited. He wasn’t sure whether he was waiting for the hummingbird, or the cat, or a nice nut to fall… but he waited. i like it. how was yesterday?